We couldn’t agree more! What’s more important than the people you love? What’s more exciting than experiencing new places? And what do we have at the end of the day? …the memories we’ve created and will continue to cherish! Recently, we were approached by a newlywed wife wanting to surprise her husband with something ikonic for their first anniversary. Of course, she came to the right place! Her words were, “weddings become all about the bride, but this year I want it to be all about the groom”. 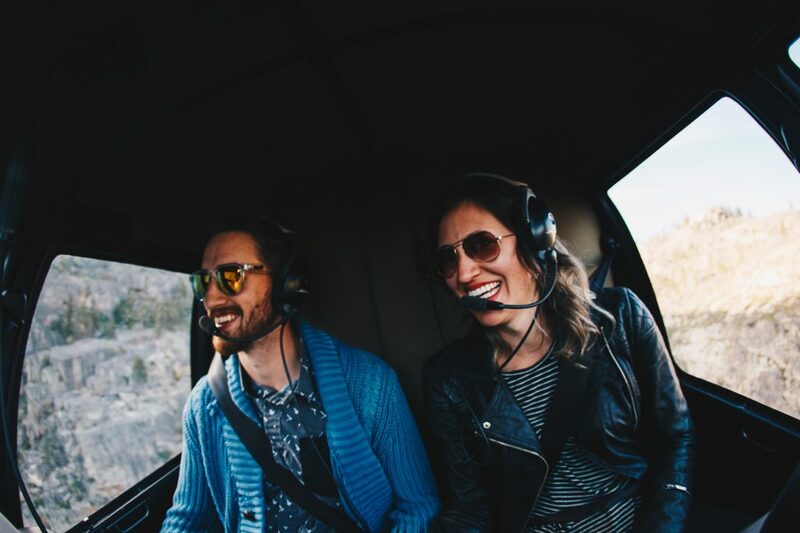 It was on her husband’s bucket list to fly in a helicopter, and it was on her bucket list to make their very first anniversary one to remember forever. We accomplished both! 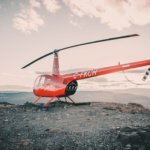 We created a custom helicopter adventure, based on her budget and requirements on landing location. 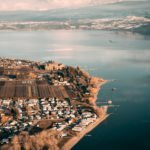 We decided on a flight over the Okanagan Lake to Okanagan Mountain Park area. It was magical! 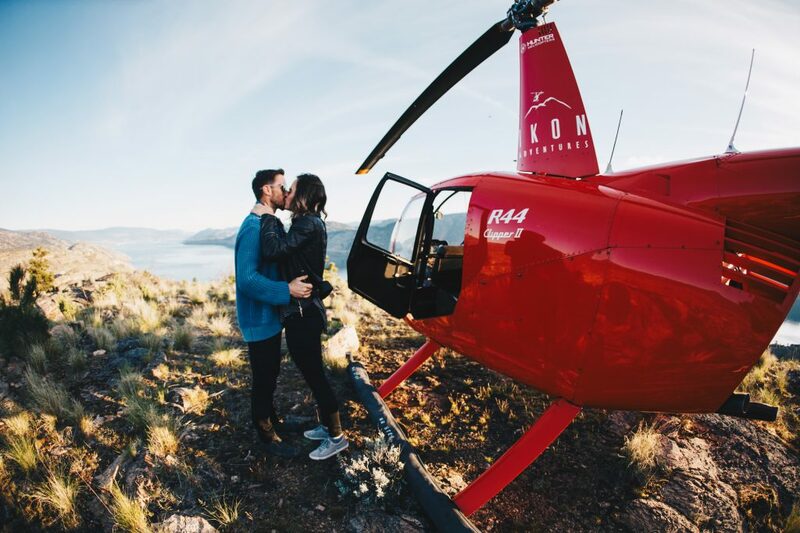 Continue reading for her perspective on a helicopter experience with Ikon Adventures in Kelowna and the best anniversary ever! How to make an Anniversary Special, Romantic and Memorable? 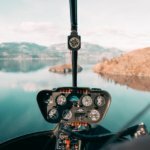 Add a Helicopter! I told him to close his eyes as we drove over the bridge to the Ikon Adventures Heli-pad. I think he peeked, but had no idea what was coming. I parked the truck, and we got out and it finally clicked when he saw the bright red chopper. The smile on his face was priceless. I was so excited! We were greeted by the Pilot, Ricky Byrom, and Photographer, Brandon Boot. 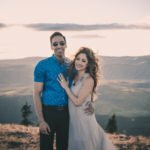 Brandon is one of Ikon Adventures’ go-to photographers, and has captured special moments for Ikon guests as well as portraits, family photography, real estate and promotional photography. His work is gorgeous and captured the day perfectly! Check out Brandon’s Instagram to see more of his work. We were given the low-down on all the safety practices, and then we jumped in, buckled up, and waited expectantly for take-off. We hovered up into the sky, with big smiles on our faces and music in our headphones. 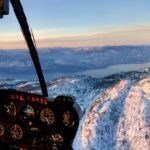 The view was spectacular as we fly over Okanagan Lake. 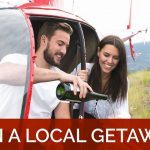 We toured right through Okanagan Mountain Park and landed on top of a mountain overlooking the lake. It was gorgeous! 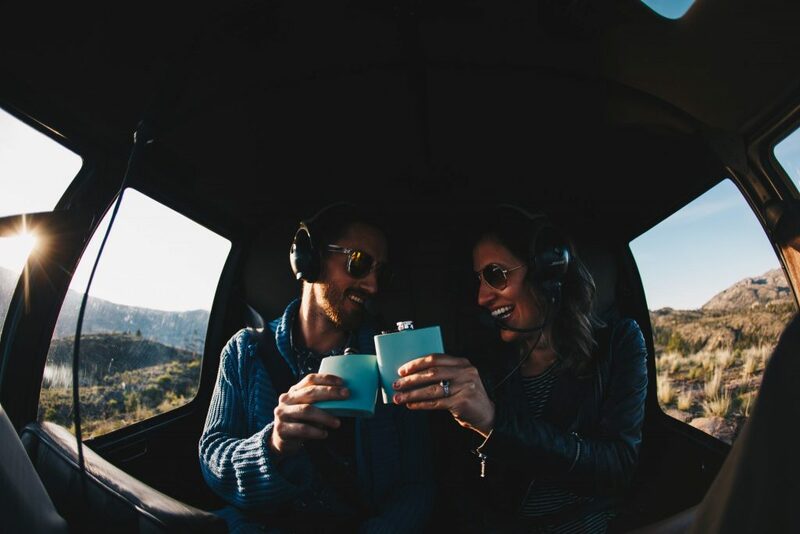 The Photographer continued to snap photos, as we had a swig from our flasks and exited the helicopter to enjoy the moment. We popped champagne and took in the view in each other’s arms. It was the perfect moment to celebrate our marriage one year ago. It might just have to become tradition! 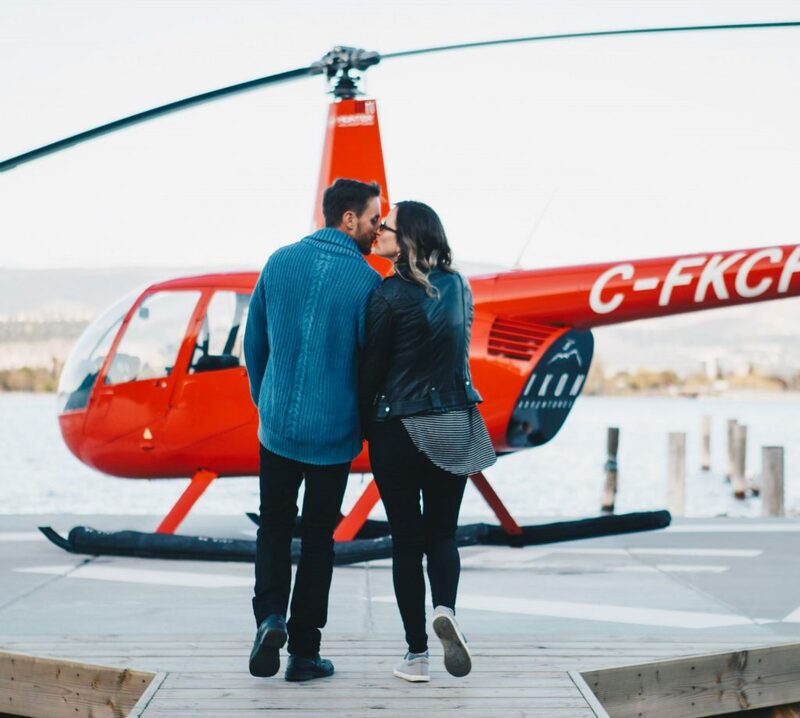 As the sun was setting, we took off again for one last cruise over the Okanagan Lake and the city of Kelowna to land back at the Heli-pad. 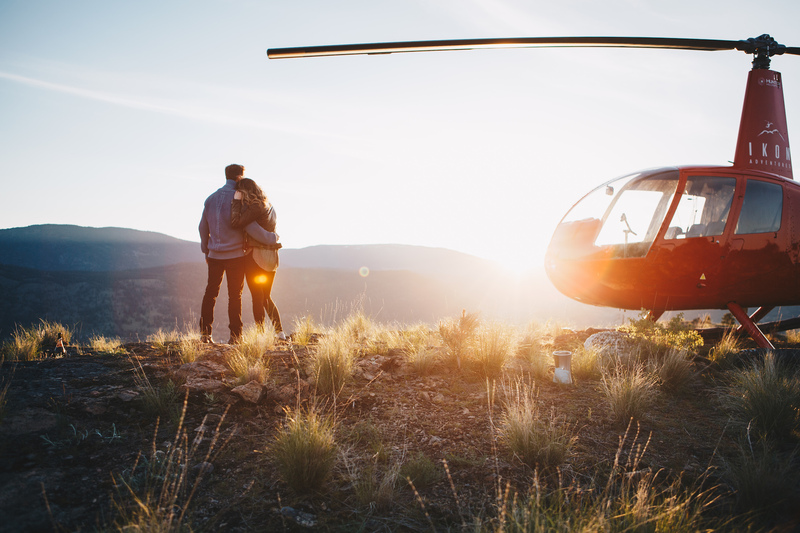 My husband absolutely loved the helicopter experience – and it was the best anniversary! I am so grateful we got to celebrate our love in an exciting and beautiful way – and have all the photos to better remember it by. 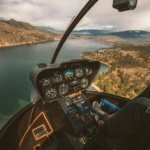 Time to plan your helicopter experience? Click here to build your own adventure or choose one of our set tours and contact us today.